Should you buy a new car? 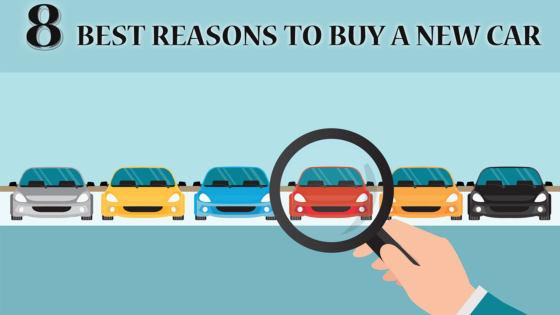 Second only to a home mortgage, a new car is perhaps the biggest purchase you’ll make. But is it worth it when there are millions of quality used cars for sale out there? Let’s go over the benefits of buying a new car vs. a used vehicle. One of if not the major perks of buying a new car is its manufacturer’s warranty. The majority of new vehicles come with a comprehensive warranty that covers defects for up to 3 years or 50,000 miles. Some auto brands offer even more coverage; Hyundai, for instance, includes an incredible 5-year/60,000 mile warranty combined with a 10-year powertrain warranty. You may also be able to purchase extended warranty coverage through your car dealer. Because of age, warranty coverage, and the fact that newer cars, on average, can drive 100,000 miles or more without major repairs, new vehicles are better options for owners who put a premium on convenience. Other than regular oil changes, tire rotations, and general maintenance, you won’t have as many issues sprout up with a new car as you would have 10 or 20 years ago. Unlike used cars, a new car doesn’t come with any potentially hidden baggage. You don’t have to worry about odometer roll-backs, unreported crashes, poor maintenance records, camouflaged flood damage, or an interior that smells like an ashtray. New means new, plain and simple. Compare a 2018 car model to its 2008 ancestor, and we bet the MPGs listed are far better now than a decade ago. Opting to purchase or lease a new car means more money in your pocket and fewer trips to the gas station around the corner. We live in a well-connected world. While a used 1999 Mercury Sable may get you from A to B, there’s nothing like traveling with all the bells and whistles in your car. Buying a new car allows you to take advantage of modern tech that makes life easier. You can opt for a car with all those flourishes of modernity, like a mobile Wi-Fi hotspot, navigation, and satellite radio. These features were unheard of two decades ago, but today they’re virtually essential. In addition to the newest technology, new cars also come with the latest in safety features. As of 2018, backup cameras are now required on all new vehicles. Many auto brands have taken additional steps to ensure their drivers and passengers are safe; some vehicles also come with standard or optional safety systems like lane-departure warning, blind-spot monitoring, collision mitigation, adaptive cruise control, and more. Although used cars outnumber new vehicles, it’s much easier to pick and choose what you want in a new car. When discussing options with your car dealer, you’ll be able to pick everything from the vehicle’s trim and exterior color to the floormats and seat upholstery. If the dealer doesn’t have that particular array available, they’ll order it for you. With a used car, you get what you get. If only you could lease a used car, right? But you can’t really lease pre-owned, which is why new cars are gaining popularity among the younger crowd. Leasing a new car is not as big of an investment as buying outright since you are paying less monthly to essentially rent your ride. Although you aren’t the owner of the vehicle per se, you do have the option to purchase it once your lease term is up. Or just swing into another new model—the choice is yours! So New Cars are Always Best? There you have it: Your 8 main advantages of purchasing a new car in Kansas City. Of course, not everyone benefits equally from buying a new car, so it’s important to go over all available options with your car dealer to ensure you’re making the right decision. If you have any other questions about buying a new car vs. a used car in Kansas City, let me know! Find me on Facebook, Twitter, or Instagram to start a conversation. Time to Buy an Electric Car Before EV Incentives Get Axed?